Luckily he soon got over his discomfort and fell in love with a P-40 painted like a tiger (or shark, or tiger shark). 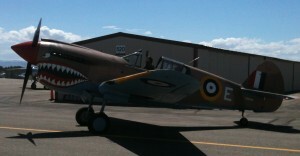 A few other planes were on the docket in front of the P-40’s so we simply had to watch them all. Oh the sacrifices we fathers make for our children! Until this past weekend I’d never seen a P-38, P-40 or P-anything in flight in person. I’ll admit, the first time nearly made me P my pants. These bad boys are surely the Harleys of the sky. Sure modern crotch rockets might be faster. But something about the rumble combined with the rough and tumble set my hair on edge. It’s no wonder these things struck fear into the hearts of our enemies. Even without machine gun fire strafing the ground around me I was fully impressed. A truly inspiring event, seeing these planes in flight renewed my gratitude for those who flew them and for the freedoms I have to revision them through fiction which I can freely sell. Viva U.S.A! Viva Dieselpunk! Viva the Fourth of July! Viva this! Dude, nice post. I’ll bet that was fun. I love those old planes, they are really impressive. Glad you and K got to go have that very cool father son experience.. Thanks, Brad. Hope you guys had a great 4th! I was in lakeview park with friends. The P-40 went by a couple of times, and I made a model of a P-38 with sticks. There are only three flying P-38’s in the world, and they are so valuable that collectors send expeditions to Greenland to fish them out of the ice, like treasure hunters. As I was saying this, a P-38 made a pass directly over our heads. Dave! It was a total blast to see them. The museum had a story board up about how a farmer had buried one of the planes (I forget which model) under his wheat field (somewhere in Canada). A rumor spread until a collector paid him big money to dig it up. They polished the thing and now it still flies!